While it may seem peculiar to be talking about attendance in the opening newsletter, it is actually the perfect time to bring awareness to the critical role it plays in student success. According to Alberta Education, students who attend under 90% are considered to be chronically absent. While that may seem to be high, it means that with a school year of 180 days, students should miss no more than 18 days which equals out to 2 days per month. Missing this many days puts student at risk of negative academic, economic, mental health and legal outcomes. Good attendance helps children do well in school and eventually in the work place. It matters for school success, starting as early as prekindergarten and throughout elementary school, and helps students stay on the path to academic success. Absences represent lost opportunities to learn in the classroom. Attendance patterns matter in all grades, including Kindergarten. Preschoolers build skills and develop habits for showing up every day on time. Elementary students learn to read in the early grades. Students are at academic risk if they miss 10 percent or more of the school year, or about 18 days a year. Once too many absences occur, they can affect learning, regardless of whether absences are excused or unexcused. Sporadic and consecutive absences negatively impact learning. Some absences are unavoidable, for example, due to serious or contagious illness but they should be prevented whenever possible. Chronic absence does not just affect the students who miss school. If too many students are chronically absent, it slows down instruction as teachers are likely to repeat material for students who have missed school. This makes it harder for students to learn and stay engaged, and for teachers to teach. Chronic absence is a problem we can solve when the whole community works together. We can all make a difference by encouraging good attendance both at home and at school. We can also work together to help solve any attendance barriers. As attendance is a priority for us, we discussed it at our opening staff meeting. We shared attendance data from 2017 – 2018 with staff so that they could see the overall trends and know if they have students who were at risk last year. The chart above summarize attendance trends for grades 1 – 5 students for the 2017 – 2018 school year. It is a celebration that 80.8% of students were at or above the 90% attendance rate. Through our awareness campaign, tracking and interventions we are hoping to improve upon the 80% this year. It was exciting to see the enthusiasm in our students, staff and parents as they renewed and made new friendships on the first day. I would like to extend a warm welcome to our new and returning families and staff members. Our caretaking staff deserves a huge round of applause as they did an amazing job of getting our school ready. My favorite part of a new school year is checking out the shiny floors! Thanks so much to Mr. Wensveen and Mrs. Wallace and the relief caretaking staff who helped to make our school opening special. Those floors, among other things, look fabulous. If you see a caretaker in the halls, please express your gratitude for all the things they do to keep our school clean. On September 21st I look forward to seeing everyone out at our Welcome Back BBQ and Family Blessing. The evening starts with a family blessing by Father Salvador at 5:45 followed by hamburgers. Following the supper at 6:45, teachers will be available in their classrooms to meet with parents until 7:30. Jennifer will have information on Sacramental preparation and our Parent Council members will also be available to meet people. Please come out and join us for a wonderful evening of fellowship and community building. We are in Year 2 of Growing in Faith Together and this year our theme is Growing in Spirit. We will nurture our faith this year through Pope Francis’ teaching that “all human persons, all of us, are important in God’s eyes.” Keeping this in mind, we will recognize the gift of others: that we are all children of God and to embrace this and recognize it in others. This teaching fits in well with our Van Tighem Virtues of Honest, Accepting, Wise, Kind and Spiritual which we will continue to develop and imbed into our school culture. Our call to action for this year is to deepen our experience with prayer. To help facilitate this, staff members received the Vatican approved book The Essential Guide to Catholic Prayer and the Mass by Mary De Turris Poust. Staff and students will receive prayer journals and a blessing from school administration. Each month we will introduce staff and students to different forms of prayer. To start the year, we prayed for our FLVT and Holy Spirit School Communities with a sweet prayer that uses M &M’s or Skittles. As you eat a candy piece, you pray the prayers according to the color of candy. I have included the prayer in the newsletter so that your family can pray for the school community. Our speaker David Wells talked to us about prayer and this was one of the things that really stuck with me: “Pray as you can, not as you ought.” He went on to say that praying in different ways will enrich you and will enrich your community. It will help in the journey towards being more missionary. I invite you to follow along with us in our journey to deepen our prayer life, try out different forms of prayer grow in our spirit as children of God. God Bless and have a wonderful year. Communication is so important to any school community to ensure that everyone knows what is going on. We have made an effort to communicate with our community through a variety of mediums. These links all start with our Website. Go to our website and get connected through these 10 methods of communication. HomeLogic – For our JH community to keep up to date on attendance, marks, and assignments. See our Home Logic Instructions in the Info for Parent Link. 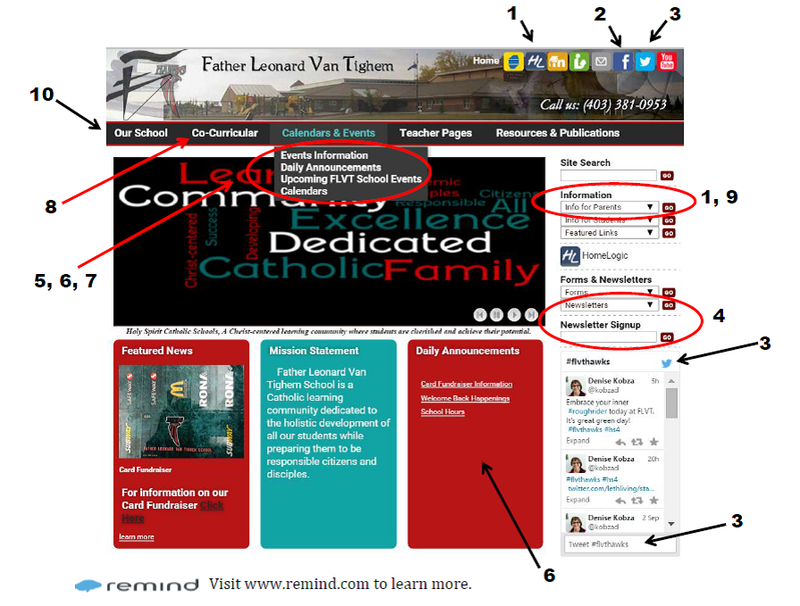 Facebook – Like and follow us at Father Leonard Van Tighem School. Twitter – @flvthawks Add our hashtag #flvthawks to your tweets. Newsletter – Sign up with email and receive our monthly Newsletter and Important Updates. Past issues are also available by using the Newsletter Link. Events Information – Forms and Letters that go home can be found here. Daily Announcements – Keep up to date on information. Upcoming FLVT School Events – Our Live Google Calendar of school activities. HAWKS Co-curricular Activities – Click Co-curricular tab to find Schedules. Remind – A Messaging Tool where we share updates, reminders, and celebrations. Subscribe by text, email or the Remind app. All personal information is kept private. We will never see your phone number, nor will you see ours. Text to (587)600-0226 & text the message: @flvtscnews. Email to flvtscnews@mail.remind.com. No subject line required.